For the Japanese magazine, see Croissant (magazine). A croissant (US /krwɑːˈsɒ̃/, /krəˈsɒnt/; French pronunciation: [kʁwa.sɑ̃]) is a buttery, flaky, viennoiserie-pastry named for its well-known crescent shape. Croissants and other viennoiserie are made of a layered yeast-leavened dough. The dough is layered with butter, rolled and folded several times in succession, then rolled into a sheet, in a technique called laminating. The process results in a layered, flaky texture, similar to a puff pastry. Croissants have long been a staple of Austrian and French bakeries and pâtisseries. In the late 1970s, the development of factory-made, frozen, pre-formed but unbaked dough made them into a fast food which can be freshly baked by unskilled labor. 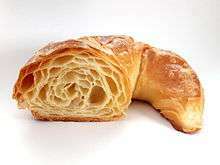 The croissanterie was explicitly a French response to American-style fast food, and today 30–40% of the croissants sold in French bakeries and patisseries are baked from frozen dough. Croissants are a common part of continental breakfast. The birth of the croissant itself–that is, its adaptation from the plainer form of Kipferl, before the invention of viennoiserie–can be dated to at least 1839 (some say 1838), when an Austrian artillery officer, August Zang, founded a Viennese bakery ("Boulangerie Viennoise") at 92, rue de Richelieu in Paris. This bakery, which served Viennese specialities including the Kipferl and the Vienna loaf, quickly became popular and inspired French imitators (and the concept, if not the term, of viennoiserie, a 20th-century term for supposedly Vienna-style pastries). 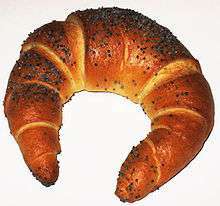 The French version of the Kipferl was named for its crescent (croissant) shape and has become an identifiable shape across the world. Alan Davidson, editor of the Oxford Companion to Food, found no printed recipe for the present-day croissant in any French recipe book before the early 20th century; the earliest French reference to a croissant he found was among the "fantasy or luxury breads" in Payen's Des substances alimentaires, 1853. However, early recipes for non-laminated croissants can be found in the 19th century and at least one reference to croissants as an established French bread appeared as early as 1850. Zang himself returned to Austria in 1848 to become a press magnate, but the bakery remained popular for some time afterwards, and was mentioned in several works of the time: "This same M. Zank [sic]...founded around 1830 [sic], in Paris, the famous Boulangerie viennoise". Several sources praise this bakery's products: "Paris is of exquisite delicacy; and, in particular, the succulent products of the Boulangerie Viennoise"; "which seemed to us as fine as if it came from the Viennese bakery on the rue de Richelieu". By 1869, the croissant was well established enough to be mentioned as a breakfast staple, and in 1872 Charles Dickens wrote (in his periodical All the Year Round) of "the workman's pain de ménage and the soldier's pain de munition, to the dainty croissant on the boudoir table"
The puff pastry technique which now characterizes the croissant was already mentioned in the late 17th century, when La Varenne's Le Cuisinier françois gave a recipe for it in the 1680, and possibly earlier, editions. It was typically used not on its own but for shells holding other ingredients (as in a vol-au-vent). It does not appear to be mentioned in relation to the croissant until the 20th century. Stories of how the Kipferl — and so, ultimately, the croissant — was created are widespread and persistent culinary legends, going back to the 19th century. However, there are no contemporary sources for any of these stories, and an aristocratic writer, writing in 1799, does not mention the Kipferl in a long and extensive list of breakfast foods. The legends include tales that it was invented in Europe to celebrate the defeat of the Umayyad forces by the Franks at the Battle of Tours in 732, with the shape representing the Islamic crescent; that it was invented in Buda; or, according to other sources, in Vienna in 1683 to celebrate the defeat of the Ottomans by Christian forces in the siege of the city, as a reference to the crescents on the Ottoman flags, when bakers staying up all night heard the tunneling operation and gave the alarm. According to one of a group of similar legends, which vary only in detail, a baker of the 17th century, working through the night at a time when his city (either Vienna in 1683 or Budapest in 1686) was under siege by the Turks, heard faint underground rumbling sounds which, on investigation, proved to be caused by a Turkish attempt to invade the city by tunnelling under the walls. The tunnel was blown up. The baker asked no reward other than the exclusive right to bake crescent-shaped pastries commemorating the incident, the crescent being the symbol of Islam. He was duly rewarded in this way, and the croissant was born. The story seems to owe its origin, or at least its wide diffusion, to Alfred Gottschalk, who wrote about the croissant for the first edition  of the Larousse Gastronomique and there gave the legend in the Turkish attack on Budapest in 1686 version; but on the history of food, opted for the 'siege of Vienna in 1683' version. This has led to croissants being banned by some Islamic fundamentalists. 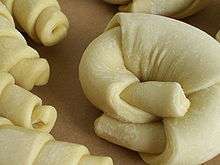 Uncooked croissant dough can also be wrapped around any praline, almond paste or chocolate before it is baked (in the last case, it becomes like pain au chocolat, which has a different, non-crescent, shape), or sliced to include sweet or savoury fillings. It may be flavoured with dried fruit such as sultanas or raisins, or other fruits such as apples. In France and Spain, croissants are generally sold without filling and eaten without added butter, but sometimes with almond filling. In the United States, sweet fillings or toppings are sometimes used, and warm croissants may be filled with ham and cheese, or feta cheese and spinach. In the Levant, croissants are sold plain or filled with chocolate, cheese, almonds, or zaatar. 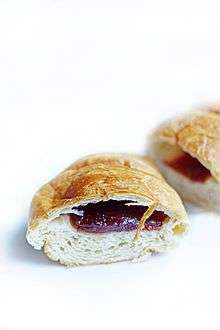 In Germany, croissants are sometimes filled with Nutella or persipan; in southern Germany there is also a popular variety of a croissant glazed with lye (Laugencroissant). In the German-speaking part of Switzerland, the croissant is typically called a Gipfeli; this usually has a crisper crust and is less buttery than the French-style croissant. Croissants are commonly served alongside coffee as a breakfast or merienda. These are referred to as medialunas ('half moons') because of their famous shape, and are typically coated with a sweet glaze ("de manteca", made with butter). Another variant is a medialuna de grasa ("of lard"), which is not always sweet. 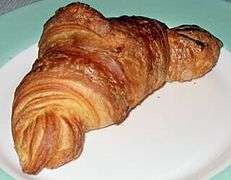 A cousin of the croissant is the Italian cornetto (in the Center and South) or brioche (in the North). These variants are often considered to be the same, but that is not completely true: the French version tends to be crispy and contains a lot of butter, whereas an Italian cornetto or brioche is usually softer. Furthermore, the cornetto vuoto (Italian: "empty cornetto") is commonly accompanied by variants with filling, which include crema pasticciera (custard), apricot jam or chocolate cream. They often come covered with powdered sugar or other toppings. Cornetto with cappuccino at the bar is considered to be the most common breakfast in Italy. On November 11, St. Martin's Day is celebrated in Greater Poland, mainly in its capital city Poznań. On this day, the people of Poznań buy and eat considerable amounts of sweet, crescent-shaped pastries called rogale świętomarcińskie ("St. Martin's croissants"). They are made specially for this occasion from puff pastry with a filling made of ground white poppy seeds, almonds, raisins and nuts. The first type of Portuguese croissant is similar to the French, and can be plain or filled with custard, chocolate, fruit jam, or a typical Portuguese cream made of egg yolk and sugar, "doce de ovo". It is customary for these to also have powdered sugar on top. The second version has a similar consistency to brioche, and is commonly eaten with ham and cheese. Sometimes this type is also served like toast, with a spread of butter. While the first type of croissant is considered a sweet, and is eaten during breakfast or tea, the second type is a more filling meal, and is usually considered a sandwich and often prepared for picnics or as travel food. Both types share the same name(French/Portuguese: "croissant") but are typically found in different bakeries: the sweet croissant is more commonly found in Portuguese pâtisseries and the brioche croissant is usually found in coffeehouses. In many Spanish-speaking countries, a croissant is called a "cuerno", meaning "horn". ↑ "Qu'est-ce que la Bible? d'après la nouvelle philosophie allemande", translated by August Hermann Ewerbeck. 1850. p. 327. Hebrew women, in the time of Jeremiah, made in honor of the pagan goddess Astarte (queen of heaven, queen of the moon) cakes, probably in the form of a crescent. ↑ Jacob Grimm and Wilhelm Grimm, Deutsches Wörterbuch von Jacob Grimm und Wilhelm Grimm 11 Archived 1 October 2015 at the Wayback Machine. ↑ The 1839 date, and most of what follows, is documented in Jim Chevallier, "August Zang and the French Croissant: How Viennoiserie Came to France", p. 3-30; for the 1838 date, see Giles MacDonogh "Reflections on the Third Meditation of La Physiologie du goût and Slow Food" Archived 3 March 2016 at the Wayback Machine. (p. 8); an Austrian PowerPoint – Ess-Stile Archived 29 May 2012 at the Wayback Machine. – gives the date of 1840 (slide 46). A 1909 image of the bakery shows the same date for its founding, but the bakery was already documented in the press before that. ↑ Chambers' Edinburgh Journal, 1847, p. 254. ↑ Mme. de Genlis, "Manuel de Voyage", Berlin, P. T. de Lagarde, 1799, pp. 54–56. ↑ "Gastronomic curiosities" (in Portuguese). Editora Abril. Retrieved 3 May 2009. ↑ Gottschalk, Alfred (1948). Histoire de l'alimentation et de la gastronomie depuis la préhistoire jusqua'à nos jours: Illus. documentaires (in French). Editions Hippocrate. ↑ Davidson, Alan (1999). Oxford Companion to Food. Oxford University Press. p. 232 – via Lynne Olver (ed.). "Croissants". The Food Timeline. .
↑ Groden, Claire (2 August 2013). "Syrian Rebels Ban Croissants in Aleppo". Time. Retrieved 9 August 2013. Look up croissant in Wiktionary, the free dictionary.